Victim of supermarket stabbing attack recounts fight with terrorist, thanks nation for their support and prayers. Niv Nehemiah, who was seriously wounded in a stabbing attack earlier this month at the Supersol branch in Yavneh, spoke of his fight with the terrorist and the long rehabilitation process he now faces. Nehemia (43), deputy director of the Yavneh branch of the supermarket chain, was stabbed 15 times by Assamil Abu Aram, 19, a resident of Yatta, near Hevron. He was unconscious for several days following the attack. The terrorist was subdued by civilians in the supermarket and turned over to the authorities. Nehemiah told Walla! News That he feels better, but he still has a long road to recovery, following the operations he underwent. "I feel better, but there is a long way to go after all the surgeries I underwent," Nehemiah, who still has difficulty speaking, wrote. I saw the terrorist before the incident, and he asked me where the toilet was in the store, about fifteen minutes before, and I remember everything from the struggle between us until he ran away and I fell to the floor and got help." Nehemiah thanked the people of Israel for their prayers for his recovery and their support for his family. "I thank all the people for their support, their prayers, and the many visits from people who did not know me and I do not know them," wrote Nehemiah. "It really warms my heart." "If the incident had to happen, then I am very happy that I have been able to encourage, strengthen and bring people together, and I thank my supportive family who surrounds me, my dear wife and the excellent doctors who do their work faithfully." 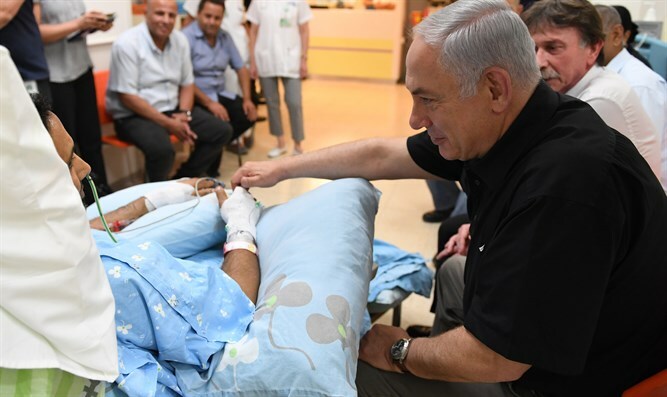 Prime Minister Binyamin Netanyahu visited Nehemiah several days after the attack. Netanyahu said at the hospital: "Niv is a hero, he just rushed with bare hands at a hateful terrorist, stopped him and prevented a great disaster." In the video of the attack, it appears that the terrorist emerged from behind the shelves of a Supersol supermarket and stabbed Niv with a knife. The terrorist passed Nehemiah first, then went back to Nehemiah with his back to him, and stabbed him.